And, these aren't dumbed-down applications. These are full-fledged mobile apps that can do everything from interact with device hardware such as the accelerometer, camera and geolocation tools to interacting with (iOS or Android) operating system to make phone calls or use Bluetooth. 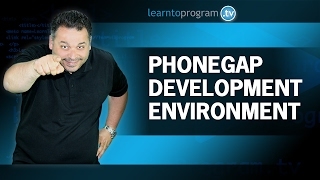 In this soup-to-nuts PhoneGap course you'll learn everything from setting up your PhoneGap environment to testing your app on your phone or tablet device. You'll learn from extensive on camera demonstrations and be able to download the many examples you see the instructor create on screen. This course gets practical very quickly as you'll be working with the phone hardware and interacting with the same real-world API's that professional developers use everyday such as Google Places and Google Maps. At the end of the course, you'll put it all together as you create full application using the Washington Transit API. This app is similar to the types of apps being placed in the Apple App Store and the Google Play Store every day! You'll join the ranks of companies like Logitech and Fan React who publish PhonGap apps directly to all of the major app stores.